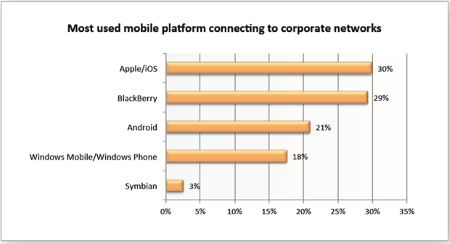 Business Networks Choose Apple and BlackBerry Over Android | BlackBerry Blast! Android and iOS are making lots of headway in the consumer market, but what about the corporate market? Is BlackBerry still dominant? According to Check Point Software, business networks still choose BlackBerry over Android. In a survey of over 700 IT Professionals for several different networks, BlackBerry is just behind Apple in the mobile OS of choice. Android is lagging quite a bit behind the two top spots. Android has not been known as the most secure mobile OS, mainly because there are so many different versions of Android out there. Whether Android security is truly lacking, the perception seems to be out there and business buyers are choosing other platforms.